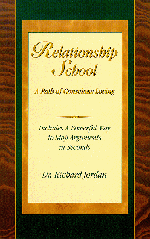 You may purchase books, CDs and other resources by Dr. Jordan and Focus On Relationship (TM) here. Click Here for Sexual Healing Resources: recommended teachers, workshops, DVDs, books, and music. Currently Featured Product: AudioVideo – White Tantra Complete Set is now discounted 35%. This newly released CD from Dr. Jordan includes a discussion of inner peace and mindfulness, meditation instruction, and a guided relaxation exercise. In less than two hours this book will help you understand your relationships and provide tools to create more loving. School? Yuck! Why write a book about school? Most of us remember school as sitting in rows with a teacher who often would rather be doing something else. School was about learning to do things a certain prescribed way, the right way. School convinced many of us that we weren’t very creative at all. School taught us how to forget our essence. I remember a time in about the fifth grade when I had finished an in-class assignment quickly, was sitting quietly, and the teacher asked me what I was doing. I responded, “I’m thinking.” The teacher was not very happy with that answer. If your school was like mine, they should have called it The School of Embarrassment and Performance Anxiety. In spite of all this, I risk your alienation by using the term Relationship School. I do this because I believe it is such a powerful metaphor. If you are breathing right now, you are enrolled in the University of Life. In the University of Life, Relationship School offers a kind of sub-curriculum that is practically unavoidable unless you are a hermit. So, the way I look at it, you might as well show up for the lessons because they are going to be presented to you anyway. In Relationship School you are invited and encouraged to be creative, to flow, and to have as much fun as you can! In fact, if you learn the lessons well, you will have fun, creative expression, and an abundance of loving. When all is said and done, this is the real school. That other school was just an unfortunate by-product of our culture. One reason I wrote this book is to save time in therapy. I have found that much of the early work with couples involves finding a way of talking about relationships that makes sense, assisting them in getting clear about just what is going on, and getting clear about what they want to manifest together. It seems to me that the essence of this process is quite similar among most couples. So, I thought, “Wouldn’t it be great if there were some way to distill the essence and provide it in a clear way that could be easily read and understood in only an hour or two?” It certainly would not answer all questions, but it might cause us to think and help give us a common language with which to enter the rocky shoals of relationship therapy, where great treasure is often found. This book is also useful for people who simply want to better understand themselves and their partners in relationship. It can be used as a foundation from which to work your own process, whatever that may be for you. Or you may simply want to talk with your partner about whatever you find in this book that stimulates you, which may help you develop a deeper awareness of the rich landscape of relationship that you are sharing.